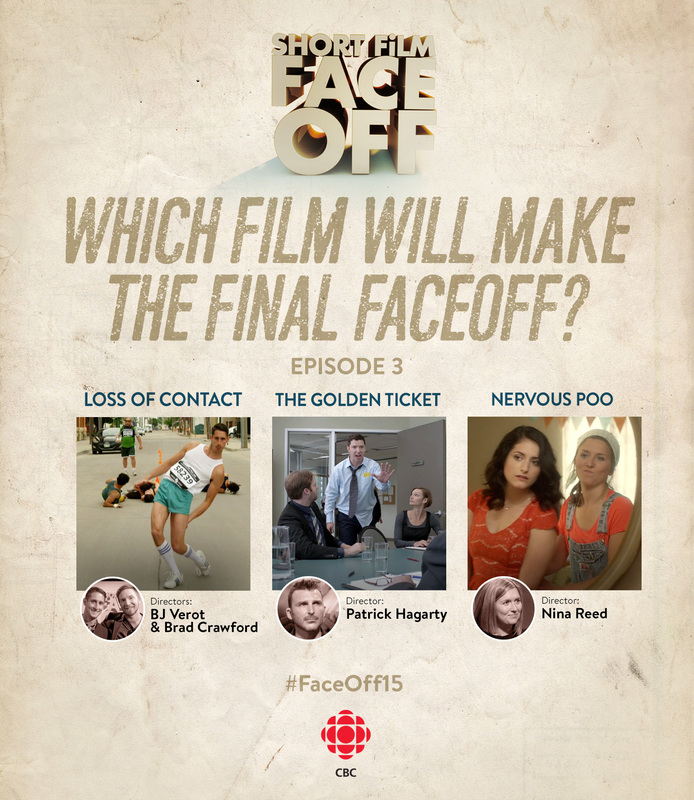 CBC’s Short Film Face Off aired its third episode on September 26th with its final trio of talented filmmakers. From this group, the third finalist was chosen to appear on the October 3rd episode for an opportunity to win $45,000 from Telefilm Canada, SIM Digital and PS Production Services in a film production prize package. The last group of filmmakers for this season comprised of BJ Verot (Loss of Contact), Patrick Hagarty (The Golden Ticket) and Nina Reed (Nervous Poo). Humour was the order of the day for all three films. In Loss of Contact, a champion race walker bows out of a competition and opens the door for a new winner; a nice guy having a bad day gets a chance to make things right on The Golden Ticket; a young woman in Nervous Poo is trapped on a toilet while her date waits on the other side of the bathroom door. Loss of Contact moved on to next week’s final round with a strong 13.5 points. Nervous Poo took second spot with 11.0 points and The Golden Ticket secured 8.5 points for third place. There was no lack of humour in any of these films. Loss of Contact was a funny send-up of documentary-style films. 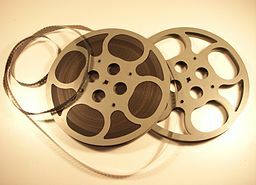 The use of a German narrator and the race walking theme gave the film a quirky European feel. The Golden Ticket was a light-hearted look at misunderstandings and aggressiveness; Carlo Rota’s role in the film made for a convincing ‘wish granter’. Nervous Poo was a comical take on first date anxiety. Instead of locking eyes in a restaurant, the couple experienced that moment in a bathroom. There was humour on the stage as well as the films. Michelle could not keep herself from laughing during the review of Loss of Contact. The film’s German voice-over and her realization that BJ was the French race walker made her giggle. Also, Nina’s revelation that the ‘nervous poo thing’ was worsening since making the film was hilarious. Not only did she laugh at the situation, but so did host Steve Patterson and the studio audience. BJ, Patrick and Nina did a great job as contestants on Short Film Face Off . Good luck to BJ (and co-producer Brad Crawford) as he moves on to the final round. Go to the website at http://www.cbc.ca/player/tv/Short%20Film%20Face%20Off to watch this newest episode and the films. Since the winner of the $45,000 prize will be reavealed on the October 3rd episode, viewers of Short Film Face Off are encouraged to go to http://www.cbc.ca/shortfilmfaceoff/ to vote for his or her favourite short film either via telephone or the website. Voters have until Sunday night to cast their ballot.